This blog is intended to focus on movies I see for the first time. Admittedly, it’s something of an arbitrary measure, but I’ve found it helpful in disciplining my writing. After all, if I opened the door to every film I’ve seen, the project would seem far more unmanageable. I wouldn’t even know where to begin, or how to go about deciding which films merit inclusion and which don’t. With that said, I’m going to make an exception this time. Next week I’m going to be at the 2014 Baylor University Symposium on Faith and Culture, whose main theme is “Faith and Film.” In particular, I will be speaking about the Woody Allen film, Crimes and Misdemeanors, and so I wanted to touch on it here, despite the fact that I’ve seen it before and have long considered it the pièce de résistance of Allen’s catalog. 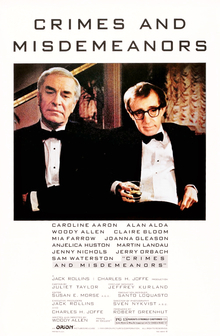 Crimes and Misdemeanors bears two distinct plot lines, but it arrives at a single metaphysical conclusion: in the face of an ethically indifferent universe, lawlessness and cunning do pay, whether in matters big (“crimes”) or small (“misdemeanors”). It is, doubtless, a bleak conclusion, but Allen tempers it with his usual combination of style and wit. Moreover, in a manner reminiscent of Ivan Karamazov in Dostoevsky’s The Brothers Karamazov, he does not so much celebrate nihilism as lament it. The film consistently invokes the possibility of a divine moral order, grounding it in the human desire to find meaning amid suffering, even as it doubts the veracity of such a vision. The central character of Crimes and Misdemeanors is Judah Rosenthal (Martin Landau) — a prosperous ophthalmologist, whose bourgeois family life and charitable reputation are put in jeopardy when he has an affair with Dolores Paley (Anjelica Huston), an area flight attendant. Desperate and unhinged, Dolores sends revealing letters to Judah’s house and calls at odd hours. She will only stop, she says, if he leaves his wife. Judah consults two persons about the problem. The first is Ben (Sam Waterston), one of his patients, who also happens to be a rabbi. Though he is slowly going blind — indeed, the tension between sight and blindness characterizes the film — Ben views life’s struggles as an opportunity to improve one’s moral character. Thus he counsels Judah to confess the matter to his wife and to seek forgiveness; it will be hard in the near term, he admits, but ultimately it will lead to a better marriage and to significant personal growth. Distrustful of this approach, Judah then confers with his brother Jack (Jerry Orbach), a hard-bitten “man-of-the-world,” who suggests that Judah have Dolores killed. Judah is initially repulsed, but, when Dolores refuses to back down, he comes to agree with Jack — a decision that not only results in Dolores’ murder, but also forces Judah to confront the Pentateuchal teachings impressed upon him as a child. In a more ironical vein, the film also follows Clifford Stern (Woody Allen) — an ambitious yet largely unsuccessful filmmaker, who is tasked with making a documentary about his smug brother-in-law, Lester (Alan Alda). Lester is everything that Cliff isn’t: he’s had great success as a television writer and producer, and he handles banquets, bedrooms, and board rooms with equal aplomb. For Cliff, then, the documentary is a lesson in humiliation, made tolerable only by Lester’s smart assistant, Halley (Mia Farrow). Halley seems to share Cliff’s more avant garde leanings, and they bond over the possibility of a future project on an eminent philosopher. Though married, Cliff begins to think of Halley as his soulmate. But she soon takes a job in London, and upon returning, she announces her engagement to Lester. Cliff, naturally, is devastated. Why is it that a self-important, spurious person such as Lester always seems to come out on top? And how could Halley not see who Lester really is? To be sure, in Crimes and Misdemeanors, no one sees anything very clearly. Lester sees himself as a cutting-edge auteur, but, in truth, he is an astute but predictable entrepreneur. Cliff, too, sees himself as a great artist, but he lacks the acumen and dedication to actually finish a project. Judah sees himself as a decent person confronted with an “unfortunate” situation, but he is also an adulterer and a cold-blooded murderer. Even God, Allen suggests, seems to be blind, as the world’s injustices unfold before him, and he (apparently) does nothing. In the face of such blindness — or, at least, of such confusion — the best one can do is pick a Weltanschauung and live by it. Thus a person like Ben chooses to live by Torah and finds happiness in doing so. In contrast, Judah decides to reject the law, even admitting, in the film’s culminant scene, that he no longer feels guilty for Dolores’ murder. He did what he had to do to get by; he is just like everyone else, except wealthier. That is his reality. Clearly, then, neither Allen nor his films subscribe to a Christian understanding of creation and fall. What’s odd, however, is that glimmers of Christian (or Judeo-Christian) insight do sparkle in Allen’s films. In Crimes and Misdemeanors, for example, Ben emerges as the character with the most integrity and, in turn, familial happiness. The only person resembling him is, ironically enough, Judah’s father, whom we meet in a flashback. In the midst of a Seder, a debate breaks out: was Hitler punished for the Holocaust? Following Tanakh, Judah’s father asserts that, one way or another, wickedness never goes unpunished. When a relative disagrees, arguing that “might makes right” in the world, Judah’s father not only reiterates his belief but adds a crucial codicil: even if his faith is not “true” according to common standards, he’d still rather believe in God, for such belief is necessary for a life of purpose and happiness. Of course, Judah eventually departs from his father’s perspective, but that does not mean that his father is wrong. Indeed, it’s curious that Allen never explores the other side of the film’s anthropology. It’s plain that, in his view, human beings want to believe in a moral order, though, in light of corruption and evil, this belief is misguided. And yet, one might reach just the opposite conclusion: given the predominant human desire for happiness, as well as the fact that the majority of human beings ascribe happiness to religious faith, perhaps the universe is not so indifferent after all. Perhaps our moral concerns, despite their ostensible feebleness, gesture toward a larger truth that will ultimately render our crimes and misdemeanors impotent?